These Garlic Butter Green Beans are the perfect ace to have up your sleeve to serve with just about anything. Using just three ingredients and taking only 20 minutes from start to finish, fresh green beans are trimmed and simmered until crisp tender before being bathed in butter and fresh garlic and seasoned with salt and pepper. Easiest. Side dish. Ever. EVER. With Easter around the corner, these Garlic Butter Green Beans are a perfect choice to serve alongside my Slow Cooker Honey Mustard Ham and Cheesy Corn Casserole. And my Cheesy Hash Brown Potatoes, of course. Talk about a well rounded meal! But because this side dish is so insanely easy, it also makes it the perfect choice for any other meal as well. Weeknight, weekend and any other night you can think of. I dare you to find another side dish recipe that uses just three ingredients and takes just 20 minutes from start to finish. 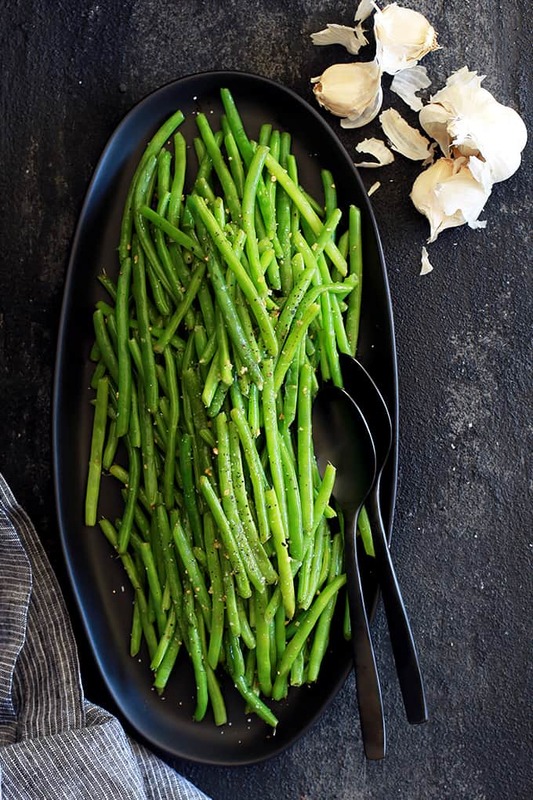 These Garlic Butter Green Beans are the perfect ace to have up your sleeve to serve with just about anything. 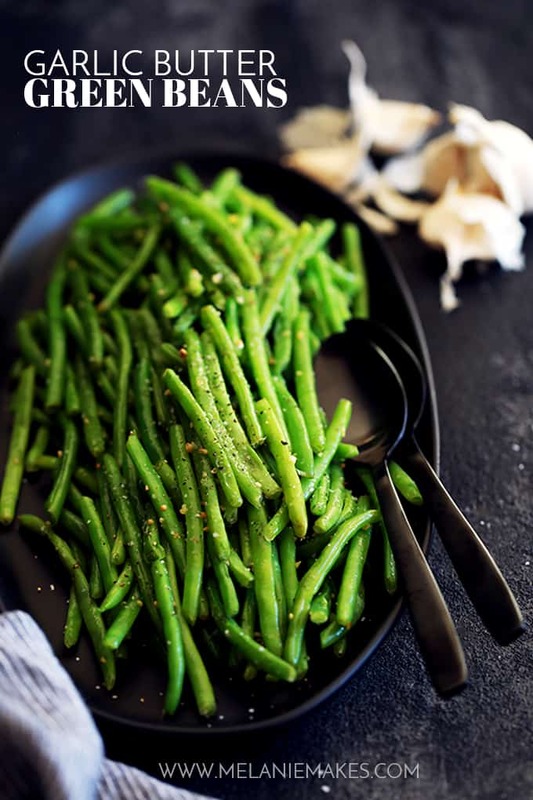 Fresh green beans are trimmed and simmered until crisp tender before being bathed in butter and fresh garlic and seasoned with salt and pepper. I have no doubt my ten and eight year old daughters could make this recipe by themselves, it’s that easy. 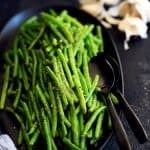 If you’re lucky enough to have a few green beans leftover, I can vouch that these Garlic Butter Green Beans would be a great addition to your next salad. In fact, after I made the ones shown in these photographs, I squirreled them away in the fridge – I don’t share food well! – for my daily lunch salads. They add such a great texture and pop of flavor to any ho hum salad. In a large saucepan over medium heat, add green beans and cover with water. Bring to a boil and then reduce heat to a simmer until beans are crisp tender, about five minutes. Drain water from green beans. Add butter and garlic to green beans over medium-low heat, allowing butter to melt and garlic to soften, approximately five minutes. Looking for other recipes featuring green beans? There are so many fans of my Twice the Onion Green Bean Casserole, which shouldn’t be regulated only to holidays! You’ll also want to check out these refreshing Green Beans with Lemon and Feta, these Sweet and Spicy Ginger Green Beans and party ready Crispy Fried Green Beans with Wasabi Mayo. These look like THE perfect green beans! I make them at least once a week, Cathy! 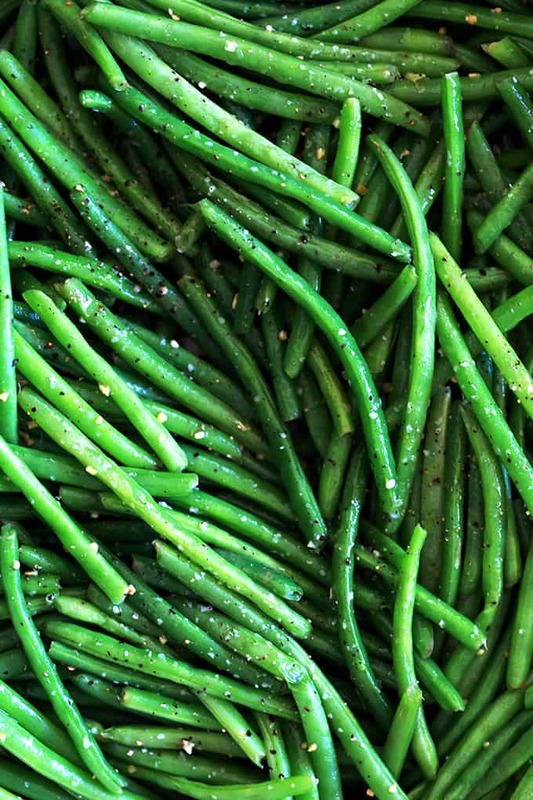 These are the best looking green beans ever! You're so kind, Krista - thank you! What a great way to eat green beans! What a great side dish. I am sure my kids would eat their green beans if I made these. This might be my new favorite way to eat green beans. This looks so perfect! I love how easy it is to make! This sounds like the PERFECT way to eat green beans! It's definitely my favorite way! 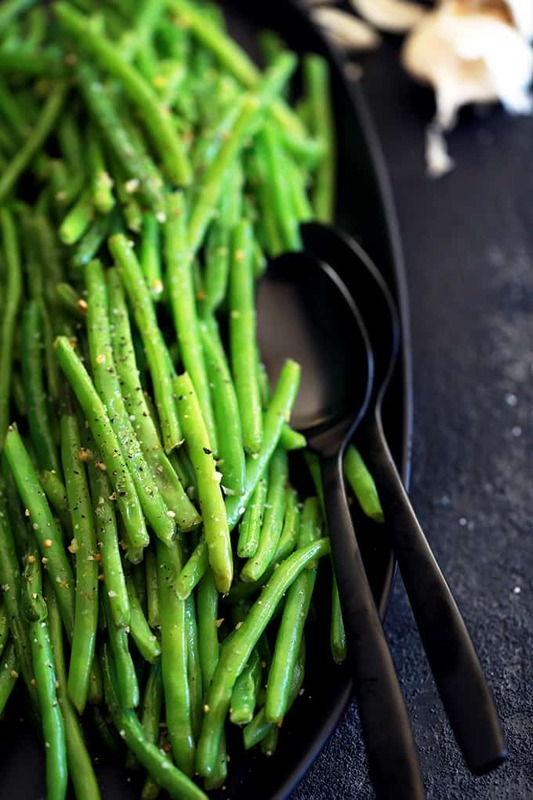 I love green beans and they're always a great pop of green on a heavy holiday plate. Can't wait to try these!